Ah Burberry, a recent discovery but one that's turned into a full scale addiction! Burberry Pale Barley eyeshadow was the one that started it off and then I decided to treat myself at Christmas. It seemed like the perfect luxurious present to myself. Here's what I picked up. As a lover of light and dewy foundations, Burberry Fresh Glow Foundation (£35) has been on my list for a while. I have the shade Porcelain No.11 and it's such a good match for me which is a relief as I picked it online without testing beforehand. Daring. It's everything I thought it would be so definitely money well spent and I've hardly reached for anything else since it arrived. It makes my skin look so radiant and dewy and it's perfect for dry skin types like mine. One and a half pumps cover the whole of my face and it has great staying power. I've been popping it on top of Illamasqua Hydra Veil and the two work very well together. The limited edition Burberry Complete Eye Palette in Gold No.2 (£40) is what spurred off this whole splurge if I'm honest. I love that all of the product from the LE Winter Glow collection come in gold packaging rather than the usual gunmetal. It makes it just that little bit extra special I think. I was torn between this palette and Mocha, but this one stood out more and is a bit different to the usual neutrals I go for. All of the colours are nicely pigmented and blend really well. There's a little bit of a shimmer to them but it's subtle and grown up. Lastly I picked up the Burberry Lip Mist in No. 214 Oxblood (£23). This is also from the Winter Glow collection but it's also part of the permanent line. I love the idea of dark lips but sometimes a lipstick is just too high maintenance if you know what I mean? I'm the kinda person that ends up with it smeared half across my face by mid morning so I went for the Lip Mist formula instead. This is sheerer than a lipstick and you can pat it on quite care free. It's super flattering on pale complexions and goes so lovely with the Fresh Glow Foundation and lashes of mascara. This is the last of my splurges for a while as I'm trying to be good, so it was good to end it all with a cracker of a purchase like these little beauts! 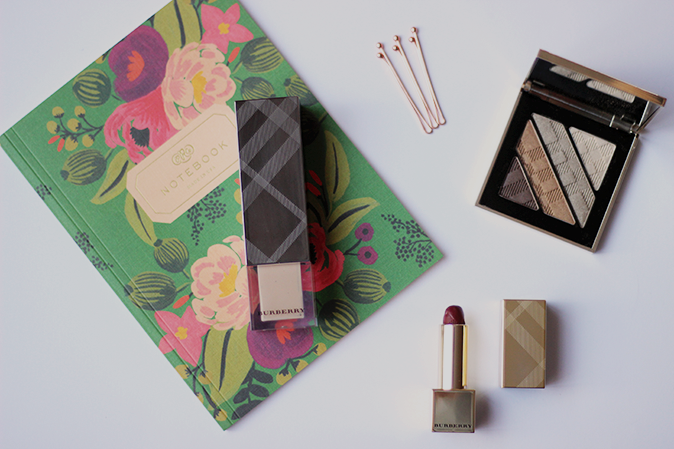 Have you tried anything from Burberry's beauty line? The post The Burberry Edit appeared first on Lelore. So luxury! I'd buy these products merely for the packaging and for them to look really fancy on my dressing table haha, the lipstick looks like such a gorgeous shade!